Judge Timothy Osterhaus is the newest addition to Florida’s First District Court of Appeal. As he approaches his one-year anniversary on the bench in May 2014, he remains a humble public servant, who is, above all else, committed to a role of judicial restraint. Judge Osterhaus spent most of his childhood in Miami. His father was a school teacher (who later became a pastor) and his mother was a registered nurse. The second of five children, he was raised in a house where serving others was a part of day-to-day life. Athletics was an important part of his life from the beginning. He was a dedicated soccer player and, during non-school hours, frequently could be found practicing with his father. His father was a former basketball and tennis coach, and the two shared a love for all things sports. When not playing soccer, Judge Osterhaus often could be found playing outdoors in the groves and fields near his home in southwest Miami or visiting with his grandparents, who lived close by. When he was in eighth grade, he and his family moved to North Carolina, where he spent most of high school. Judge Osterhaus played soccer, tennis, and basketball at Charlotte Christian School (his jumpshot “definitely not” portending that of later CCS alum and NBA star Stephen Curry). Before his senior year of high school, Judge Osterhaus’ family moved to Bristol, Tennessee. He made friends quickly at his new high school by joining the football team and kicking his team into the state playoffs with a field goal on the final play of the regular season. After graduating from high school, Judge Osterhaus attended King College, a small liberal arts college in Bristol, where he played on the soccer team. He majored in psychology, believing that he could best serve others as a clinical psychologist. He liked the idea of helping people find solutions to problems as a counselor. After taking an introductory law course, he realized that he was passionate about the law, and could better serve others as a legal counselor. After receiving his bachelor’s degree, Judge Osterhaus spent a year traveling and doing volunteer work, and then headed off to law school. 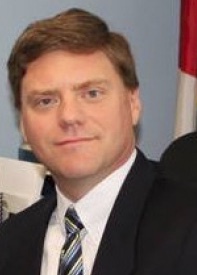 Judge Osterhaus earned his law degree from the University of Virginia. He enjoyed law school, but did not know which field of law he wanted to pursue by the time he graduated. He accepted a position as a law clerk to United States District Judge Kenneth Ryskamp in the West Palm Beach Division of the Southern District of Florida. His decision to clerk for Judge Ryskamp must have been driven by fate, since it is where he met his wife, Kristina, who was his co-clerk. There, he saw the law (which in law school always seemed somewhat theoretical) come alive for the first time. After finishing his clerkship with Judge Ryskamp, both Judge Osterhaus and his future wife moved to Washington, D.C., where they had accepted positions with private law firms. For the next seven years, Judge Osterhaus’ practice focused on administrative litigation involving international trade and on general business law. Within months of the birth of their third child, Judge Osterhaus and his wife set their sights on returning to Florida. He accepted a position with the Florida Department of Education (“Department”). The new position required them to move to Tallahassee, which they found to be an ideal place to raise children. (Today, they have four children between seven and eleven years old.) At the Department, Judge Osterhaus continued his work in administrative litigation, worked on rule-making and policy issues, and got an expanded taste of appellate work. When Attorney General Bill McCollum took office in 2007, Judge Osterhaus joined the Solicitor General’s Office, where, for six years, he represented the state and state agencies in appeals before state and federal courts, including the United States Supreme Court. The Solicitor General’s Office deepened his passion for appellate practice. He enjoyed working on complex cases involving a wide variety of substantive laws, which required in depth legal analysis. As Deputy Solicitor General, and later as Solicitor General appointed by Attorney General Pam Bondi, Judge Osterhaus worked on many notable cases, including Florida’s challenge with twenty-five other states to the 2010 federal Affordable Care Act. Based on his experience on the bench so far, he graciously shared the advice he would offer to practitioners. First, he emphasized the importance of clear and concise brief-writing. Briefs should tell a story that’s readily accessible. Sentences that are complex and require several readings are roadblocks in the way of your legal points. Practitioners should strive to simplify; even a ten-year-old should be able to understand your basic argument. Second, always hold moot court sessions to practice your oral arguments. This will help you prepare for difficult questions, better understand what points you can concede, and, ultimately, present a more effective oral argument. On behalf of all practicing attorneys in the state of Florida, we welcome Judge Osterhaus to the First District Court of Appeal. Elizabeth “Ellie” Neiberger is an associate with Bryant Olive and Miller in Tallahassee, Florida. She primarily practices in the firm’s Litigation, Bankruptcy and Creditor’s Rights and Real Estate Practice Groups.